MOBIO Café Meeting on Jan. 21 was a hands on style. Three new exhibitors explained their technologies in the evening. Adhesive-type insect traps, 360 degree torque hinges and metal bezel, product protecting extrusion net. 1) SAITO LIGHTING CO., LTD. The new product "Toletela" has been developed based on its own experiene. 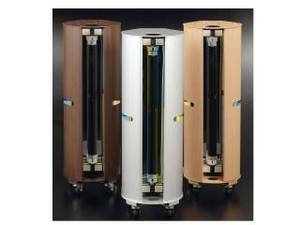 Wider mouth to attract moths, mirror refrector panel for brighter light beam, portablity with casters. One data shows it captureed 4.5 times more moths than competitive 20W models though it ha sonly 10W power. SHIKATA manufactures precision stamped parts and functional custom hinges. Various materials can be stamped from thin plates of 0.05 mm to thicker plates. And patented two-axis hinges that support opening/closing and rotation, 360-degree hinges for electronic devices. 3) KITAI SEISAKUSYO CO., LTD.
KITAI manufactures injected plastic products for a variety of fields, including raised floors, building materials, food containers, and general daily goods. It propoes to use extrusion net molding, "Alpha-Dianet", as a product protection during transportation. Vacuum bag is another proposal by them to export tools, dies and equipment. It fits to complex shape itesm easily. The next MOBIO Cafe Meeting is scheduled on on February 4. 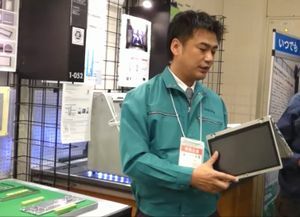 It is technology presentation on by 11 companies from "Kansai New Selection 2018″ exhibition.